If your stress level remains excessive for a prolonged length of time, the adrenal glands respond by producing the adrenal hormone, cortisol, continually. 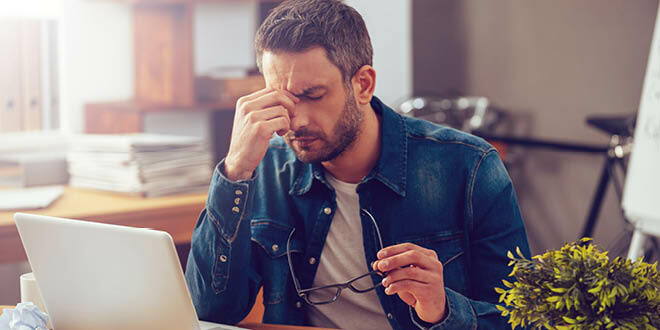 This over-exertion taxes the adrenal glands to the point where the glands are unable to produce the necessary levels of cortisol to keep up with the demand; and subsequently these drastically diminished levels of cortisol eventually lead to adrenal fatigue. This hormone imbalance induced fatigue affects all the other hormones in the body, producing a chain-like reaction. While attempting to maintain high cortisol production to manage the chronic stress levels, the adrenal glands are unable to maintain the production of other necessary hormones. One such hormone is DHEA, or dehydroepiandrosterone. DHEA is vital to maintaining the balance of hormones in your body and low amounts of this important hormone contribute to adrenal fatigue symptoms. Adrenal Dysfunction sufferers often have a difficult time dealing with physical or emotional stress. The low hormone levels associated with late-stage Adrenal Fatigue can be the cause of many common symptoms which are rarely addressed as a whole by traditional medicine. Chronic stress or Cortisol secondary to Adrenal burn out could be an integral factor to your poor mental/physical health. Post Menopause Stress and adrenal dysfunction go hand-in-hand. The adrenal glands, two triangle-shaped glands that sit over the kidneys, are responsible for regulating the body’s response to stress by controlling the hormones released during stress. When stress becomes chronic or is not well managed, the adrenal glands are unable to function optimally. Cortisol is the main adrenal hormone and it is used to manage stress. The highest amount of cortisol is secreted by the adrenals in the morning to get us going, with levels decreasing throughout the day. The adrenals secrete cortisol in response to low blood sugar, stress, exercise, and excitement. Dr. Sonn has successfully helped patients suffering from adrenal fatigue with comprehensive, customized treatment plans. The first step in treating adrenal fatigue is complete comprehensive lab testing to determine cortisol levels. Adding bioidentical hormone replacement therapy and a targeted, high-quality supplement regimen are often the next steps. To maintain healthy adrenal function, adults should avoid hydrogenated fats, excessive caffeine, refined carbohydrates, alcohol, and sugar. Instead, opting to eat a diet that includes quality protein with regular meals of high nutritional value. Getting eight hours of sleep every night is essential to give the adrenals an opportunity to repair. Furthermore, taking time to evaluate daily and situational stressors and practice stress management with deep breathing, meditation, or yoga can be a very beneficial in addition to your customized regimen. You no longer need to suffer the symptoms of adrenal fatigue; many patients have found the solution to adrenal fatigue treatment is an integrated approach using advanced therapies, such as bioidentical hormone therapy and strategic lifestyle changes, like a balanced nutrition and stress management.